Practice l ink.com F A ll 2018 31 J O B D O C T O R As a physician in training, you have plenty of reasons to hold your breath. 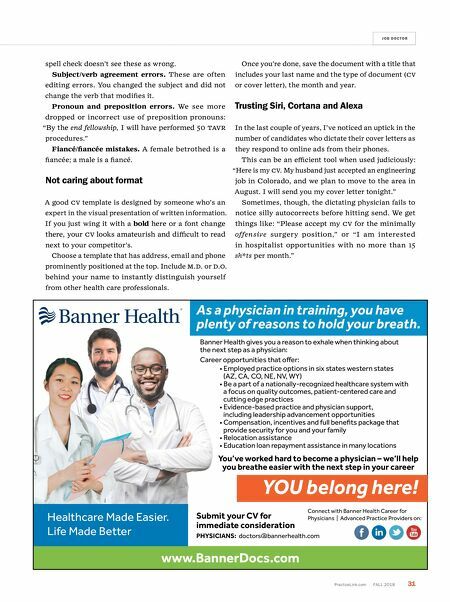 Connect with Banner Health Career for Physicians | Advanced Practice Providers on: www.BannerDocs.com Submit your CV for immediate consideration PHYSICIANS: doctors@bannerhealth.com Healthcare Made Easier. Life Made Better Banner Health gives you a reason to exhale when thinking about the next step as a physician: Career opportunities that offer: • Employed practice options in six states western states (AZ, CA, CO, NE, NV, WY) • Be a part of a nationally-recognized healthcare system with a focus on quality outcomes, patient-centered care and cutting edge practices • Evidence-based practice and physician support, including leadership advancement opportunities • Compensation, incentives and full benefits package that provide security for you and your family • Relocation assistance • Education loan repayment assistance in many locations You've worked hard to become a physician – we'll help you breathe easier with the next step in your career YOU belong here! spell check doesn't see these as wrong. Subject/verb agreement errors. These are often editing errors. You changed the subject and did not change the verb that modifies it. Pronoun and preposition errors. We see more dropped or incorrect use of preposition pronouns: "By the end fellowship, I will have performed 50 t AVR procedures." Fiancé/fiancée mistakes. A female betrothed is a fiancée; a male is a fiancé. Not caring about format A good CV template is designed by someone who's an expert in the visual presentation of written information. If you just wing it with a bold here or a font change there, your CV looks amateurish and difficult to read next to your competitor's. Choose a template that has address, email and phone prominently positioned at the top. Include M.D. or D. o . behind your name to instantly distinguish yourself from other health care professionals. Once you're done, save the document with a title that includes your last name and the type of document (CV or cover letter), the month and year. 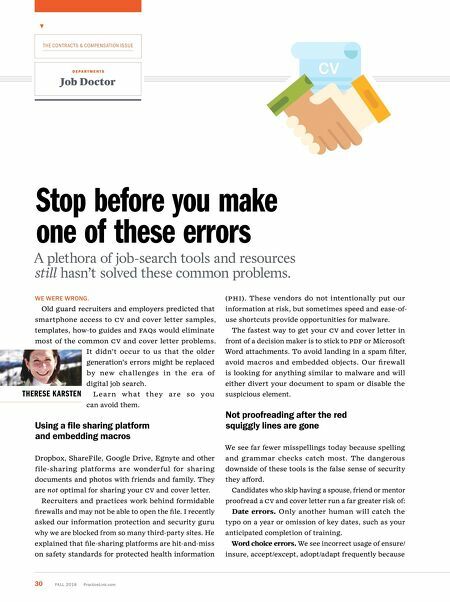 Trusting Siri, Cortana and Alexa In the last couple of years, I've noticed an uptick in the number of candidates who dictate their cover letters as they respond to online ads from their phones. This can be an efficient tool when used judiciously: "Here is my CV. My husband just accepted an engineering job in Colorado, and we plan to move to the area in August. I will send you my cover letter tonight." Sometimes, though, the dictating physician fails to notice silly autocorrects before hitting send. We get things like: "Please accept my CV for the minimally offensive surgery position," or "I am interested in hospitalist opportunities with no more than 15 sh*ts per month."